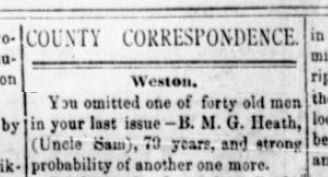 The PRESS is indebted to Mr. J. H. Walker for the following list of names of Crittenden county's forty oldest citizens. The figures at the right is the age of each. There is probably no man in the county more conversant with its early history, especially in a biographical way, than Mr. Walker. There are very few of the old families whose history for generations is not stored away in his remarkably retentive memory. Chesteen Hood, 90; J. S. Grady, 88; Joel Moore, 87; Ephriam W. Hill, 86; Henry Walker, 85; Silas Corum, 85; Thomas Wright, 84; Timothy Taylor, 84; Burton Ford, 84; Hugh Beard, 83; F. H. Croft, 83; G. F. Clement, 82; Gatesfield Farley, 82; P. C. Barnett, 81; Mathew Hughes, [81;] Chesley Nunn, 80; Reuben Cook, 80; Joshua Kemp, 80; Bazil Butler, 79; Edward Dority, 79; James King, 79; John Hodge, 79; J. H. Hawkins, 78; Edmond Holomon, 78; J. G. Nations, 78; Leander Hughes, 77; Isaac Sisco, 77; U. G. Witherspoon, 77; Chapel Nunn, 77; Watson Wood, 77; A. J. Hill, 76; W. P. Maxwell, 76; Robert Heath, 76; John S. Fowler, 75; U. L. Horning, 75; Wayne B. Shaw, 75; Bazil Jacobs, 75; John D. Thurmond, 75. Sam Smith, 87; Amos Woods, 84. Source: Crittenden Press. (Marion, Ky.) 1879-1907, September 3, 1891, Image 2 - Chronicling America - The Library of Congress. You omitted one of forty old men in your last issue - B. M. G. Heath, (Uncle Sam), 79 years, and strong probability of another one more. Source: Crittenden Press. (Marion, Ky.) 1879-1907, September 10, 1891, Image 2 - Chronicling America - The Library of Congress.